I took out my keys to open the front gate, the corner of the wall was empty. It was an unbearable scene. "I just bought a dog. You can have it. Yeah, from a client. No choice, a new way of entertaining client. Big business mar...heh heh"
That was from my cousin. I immediately ran to his house, which was a few blocks away from mine. I was looking around, trying to spot a cute brown puppy. Could it a Golden Retriever? Or a Labrador? Hmmm...it could be a Terrier or a Beagle. I don't mind. I was already grinning. "Where? Where? Where? Where is the dog?? Which looks nowhere near like a 'dog'. I showed my cousin a sepuluh sen face. "Huh? I thought you told me it is a 'dog'?" "Yeah. A Pekingese what. It is a dog, you dummy. Oh but it does look like a cat hor? Garfield..hahahah!" The next thing I know is that something furry landed on my lap. It is her. She came towards my direction and cuddled up herself on my lap comfortably. She was not wary of me at all. That was the sweetest thing I have ever seen in my life. I looked at her in her eyes. "We'll go home together, ok?" She wagged her furry tail. I think she answered 'yes'. I believe, Marley aside, she is by far the most difficult and fussy dog to keep. She sworn by heart not to take any dog food. Pedigree premium biscuits, chewy sticks or chicken-in-can. She spat out whatever dog food that we bought. 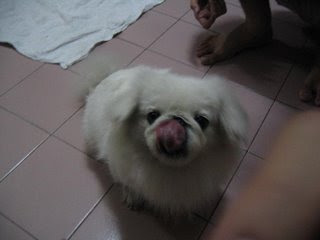 Her peculiar eating habits will make you wonder if she reincarnated wrongly into a body of a white Pekingese. She really knows how to eat. 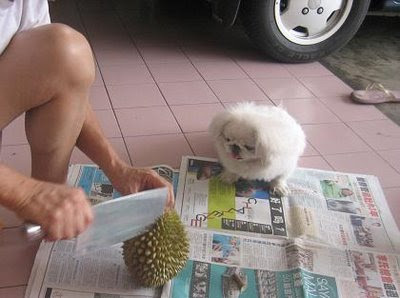 She likes durians. D24. No kampung. No thai. Like owner, like dog? I don't deny that. My stay with her didn't last too long. 2 years later when I finished my high school, I left her at home and moved to Subang Jaya to do my A-Levels. And then it was degree in Australia, followed by working in KL. Until now stationed down south. Wherever I go, she remains the one closest to my heart. Until the day when my mum returned home to find her laying on the floor in her usual position, but this time round stone cold. It hurts me everytime to think about her departure. 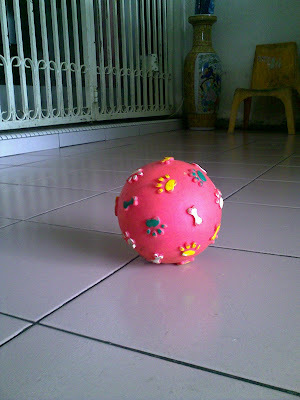 What really happened to her while no one was around at home, and the things that I would give up just to listen to her barking at the background whenever I call home or to see a running fur ball whenever I open the front gate. I hope you had a happy life whilst staying with us. Rest in peace, my girl. Oh dear, such a sweeeeetie she was...must be so tough losing her. But what nine wonderful years those must have been. She's so funny and adorable. Your post makes me sad. She was REALLY REALLY CUTE. Yea, time waits for no one.. We used to forget this, so appreciate whatever you have now with no regrets. 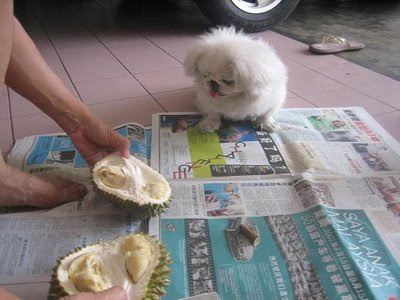 RIP to your sweeties doggie..
She was a cutie (especially that shot of her looking at the durian! ).